The Premier Pet™ Car Safety Harness keeps your dog safe and secure during travel. 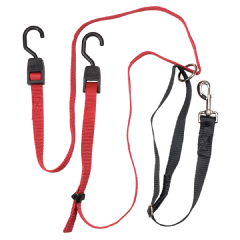 Once your dog steps into the harness, simply tighten down the adjustable straps until it fits snug around him/her and attach the harness to any seatbelt. When strapped in, your dog will be allowed a range of motion unless there is a sudden stop. The harness will then lock, using 2000+ lb. strength tested nylon to secure him/her to the seat. With your dog secured to one location in your vehicle, driver distraction is reduced, and you and your dog can travel safely together. 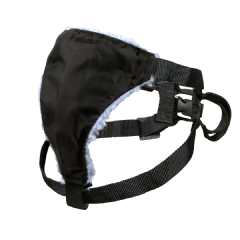 Large sized harness is best for dogs weighing 45-85 lb.